Yellowstone National Park was established in 1872. The Oregon Short line Railroad completed the train track to the western boundary of Yellowstone National Park in November of 1907, the first train arrived in 1908, the line was discontinued in 1977. The wonderful buildings that had been built to service visitors to the area, among them the train Depot & U.P. Dining Lodge, were given to the town & are part of the "Oregon Short Line terminus Historic District" located on Yellowstone Ave. West Yellowstone, Montana. As tourism blossomed during the first decades of the twentieth century, the Union Pacific Railroad considered how to better accommodate travelers. 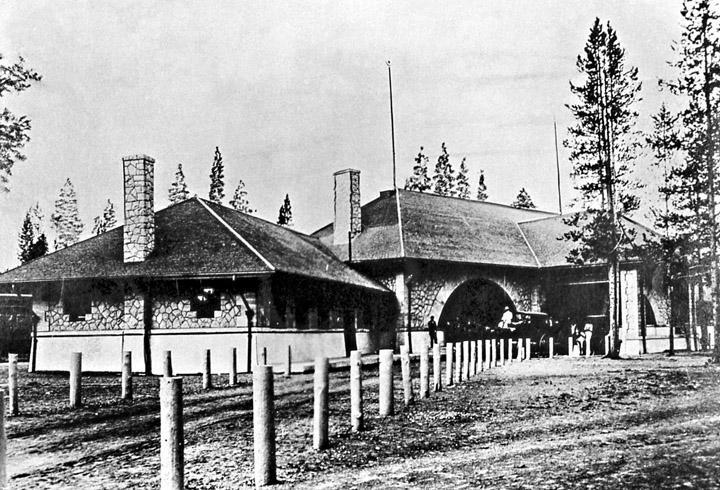 Officials conceived the idea of building restaurants and pavilions architecturally similar to the monumental lodges being constructed in national parks. Acclaimed architect Gilbert Stanley Underwood, whose mastery of the Rustic style set the standard for national park architecture, designed this splendid dining lodge for the Union Pacific. 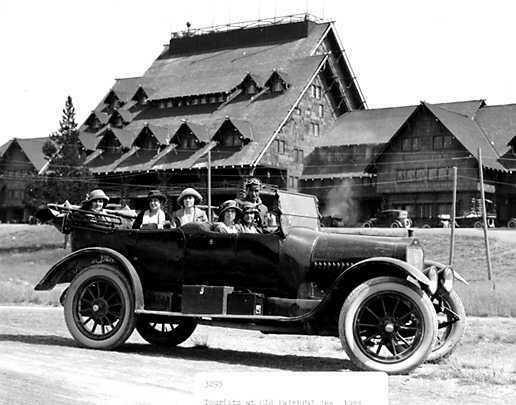 Completed in 1926, it was an intermediate project built while Underwood was designing the world-renowned Ahwahnee Hotel at Yosemite National Park. 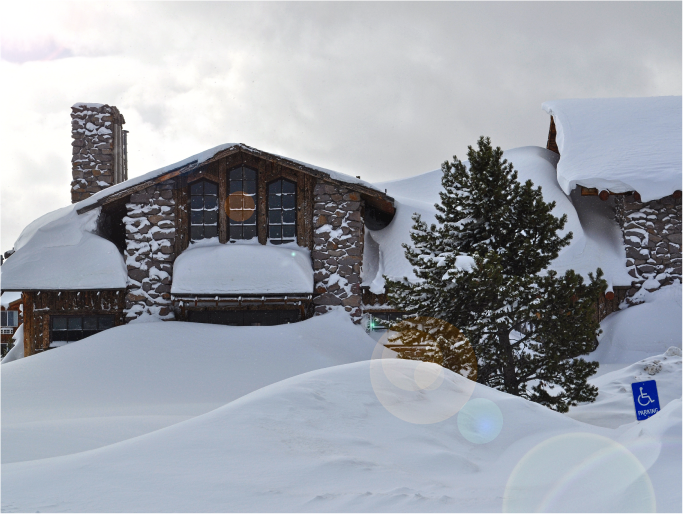 The Rustic style of this lodge, its wood and welded tuff in grand harmony with the landscape, echoes that of the famed hotel. Featuring mammoth walk-in fireplaces, the multi-level interior is characteristic of Underwood’s designs. As part of a national collection of Underwood’s work, the lodge gains added significance as a rare surviving example of a railroad dining hall constructed to mimic park architecture. 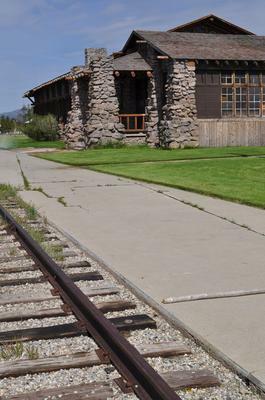 The Union Pacific Dining Lodge was constructed in 1908 with only a kitchen and a serving area. By 1920 the UPDL had become so popular that there was a need for more space to accommodate more guests and so a rest pavilion was built in 1922. As the new railroad began to bring more people into West Yellowstone more room was needed to serve it’s guests so by 1925 the dining lodge that could serve up to a thousand meals per day was completed. That is the historic rock and timber dining lodge you see today. 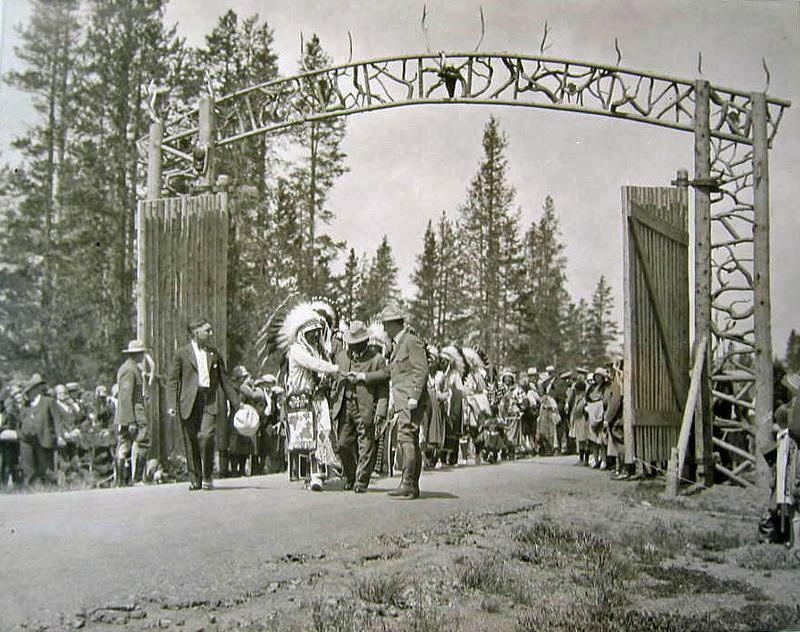 West Yellowstone's history closely mirrors the history of Yellowstone National Park. When the park was first formed, early guides would have lead their clients into the park by following the course of the Madison River through the area that would one day become West Yellowstone. 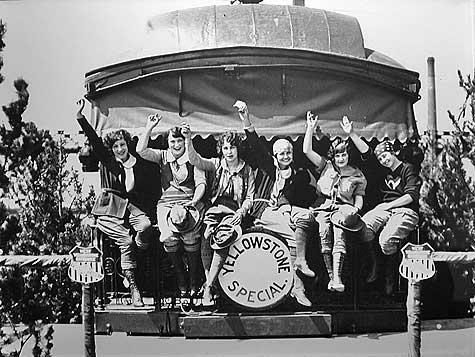 Later in 1908, the first train loaded with tourists arrived on the Oregon Short line railway extension. Over the course of several years, the track was constructed up from Ashton, Idaho through Island Park, Idaho, over Targhee Pass and into West Yellowstone, harkening the founding of the little town at the end of the line. At first, visitors didn't linger; but rather made their way in and out of Yellowstone only pausing long enough to grab a meal and make the train on time. Since then, visitors have found out about the hospitality of West Yellowstone and the great outdoor opportunities on all four sides of the "town at the end of the line". Until 1908, Yellowstone National Park belonged only to a small group of hearty souls and dedicated travelers who were determined to explore the park’s wonders. On a fateful June day of that year, the iron horse arrived at a small Montana town just west of the park’s boundary. That town was West Yellowstone and since then trains - now roads - bring multitudes of tourists to Yellowstone’s spectacular sites. That innovation heralded the tourism industry that made West Yellowstone what it is today. The years before railroad access mainly brought visitors coming from nearby territories. 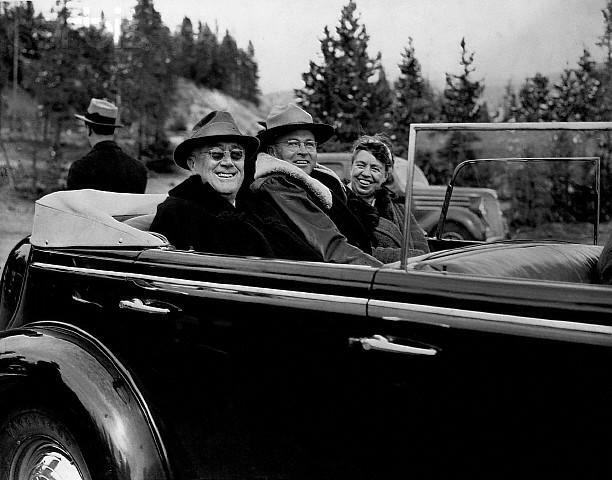 A journey into Yellowstone Country at that time required lengthy planning. To help with the task, a primitive service industry quickly developed to cater to visitor’s needs and to provide transport to, from, and through the park. Gilman Sawtell of Henry’s Lake, Idaho and namesake for Sawtell Peak just south of West Yellowstone, was one of these original guides. He offered travel packages into Yellowstone via the West Entrance. Prior to railroads, people arrived in wagons, which must have been substantially more difficult. The first known wagon trip arrived in 1877. These transportation pioneers were forced to unload and disassemble their wagons to cross the original bridge built across the Yellowstone River. In 1881, the first stagecoach tours, operated by Marshall and Goff Stage Lines of Virginia City, Montana, arrived. They traveled up the Madison River to the Lower Geyser Basin to Marshall’s hotel at the confluence of Nez Perce Creek and the Firehole River. As access became easier, more people visited the area, bringing on the era of modern tourism. It would still take time, though, and through the 1880’s, the railroad lines gradually drew closer to Yellowstone. Soon people only needed one or two days, instead of the traditional week, to reach the park by stage coach or horseback. The Army Corps of Engineers, which had been given responsibility for park maintenance, worked busily to upgrade existing roads, bridges, and access, creating the present day Grand Loop. Throughout the 1890’s the Northern Pacific and Union Pacific railroads heavily promoted visits to Yellowstone, and the number of visitors steadily increased. In 1893 the Northern Pacific reached the north entrance at Gardiner. In 1905, railroad executives from the Northern Pacific and Union Pacific lines met behind closed doors at the Lake Hotel. Although it is not known for certain what was said at the meeting, most historians believe that officials of the two railroads agreed on a deal to share hotel rooms built by the Northern Pacific within the park. Upon leaving the meeting, Union Pacific president, Mr. E.H. Harriman gave the orders to begin the extension of the Oregon Short Line Branch from Ashton, Idaho, to the West boundary of Yellowstone National Park. 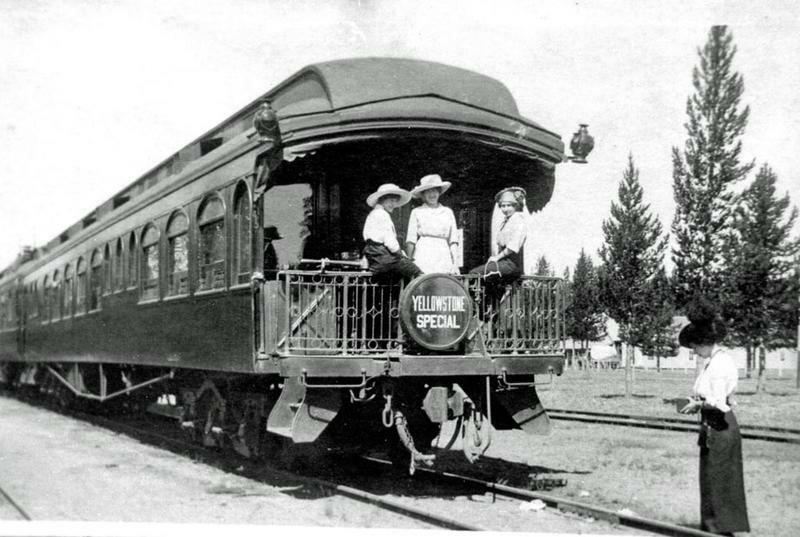 By 1906, the line was at Big Springs, Idaho just across Targhee Pass, and on June 11, 1908, the first train of visitors arrived at the West Entrance on the Union Pacific’s ”Yellowstone Special.” For fifty-two years, the Oregon Short Line would offer train service into West. The Town of West Yellowstone sprang up in the summer of 1908 at the terminus of the Oregon Short Line branch at the West Gate of Yellowstone. By the end of the first decade of the 1900s, the private automobile was becoming increasingly popular. By 1915 the pressure from motorists, automobile businessmen and nearby towns was so great that Yellowstone was opened to automobiles for the first time. That first year, they shared the roads with the stagecoaches, which was an incredible challenge. Within a year of enduring automobile traffic, Yellowstone’s roads were decimated and officials realized that they needed to widen bridges and redo the road system. Winter storms, spring thaws and summer showers created natural obstacles, rendering many roads impassable. In the mid 1930’s park roads were paved for the first time. 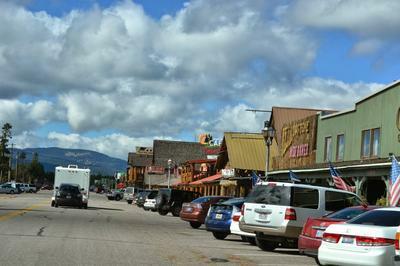 With the advent of the automobile, the pace of life in West Yellowstone started to pick up. With more and more people arriving by auto, the town site, leased from the Gallatin National Forest, continued to grow. World War II brought a pause in visitation due to gas rationing and a discontinuation of train service. After the War, most people abandoned the trains for their personal automobiles. The town boomed, and more visitor services sprang up to cater to the summer trade. The 1950s saw a few adventurous folks start using snowmobiles to visit the park in the winter. By the time train service to West was discontinued in 1960, service had declined to two trains a week, from a height of two a day in its heyday. 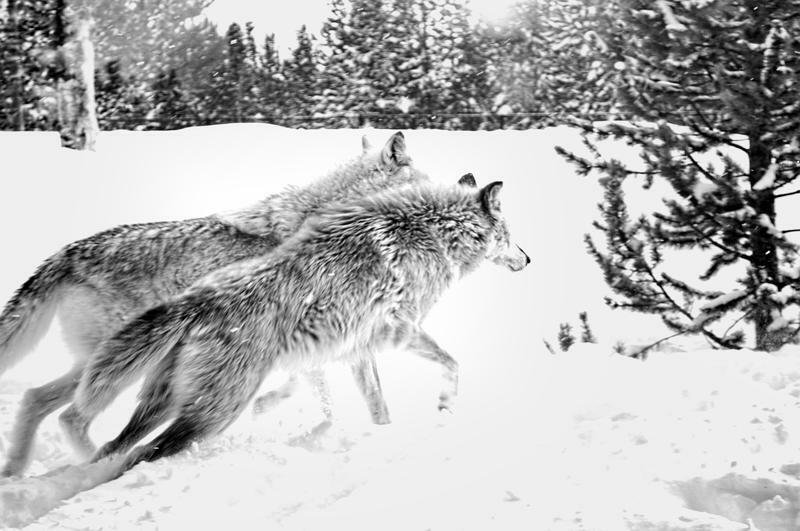 In 1971, Yellowstone opened officially for the winter. Today snowmobiling is one of West’s most important industries. West Yellowstone sees thousands of tourists each winter. Like the introduction of the automobile, the introduction of snow machines into the park has raised controversy and questions of how best to handle the numbers of people who want to visit Yellowstone in the winter. Whatever the future holds, from monorails to a park bus system, West Yellowstone will be here celebrating its role in the development of transportation and visitation to Yellowstone National Park. For more information, please contact the West Yellowstone Historical Society, P.O. Box 1225, West Yellowstone, MT. 59758, (406) 646-7461. Yellowstone’s West Entrance is the park’s busiest, so it’s no wonder that West Yellowstone, Montana, is a bustling gateway packed with dining, shopping, and attractions for travelers. Located just across the Wyoming border, West Yellowstone is a convenient entrance town for those coming from Idaho or western Montana, especially Missoula and Butte. Visitors will find lots of Wild West flavor, plenty of lodging, and a hub for outdoor activities in and around the park. Montana is a beautiful state with wide open spaces and big skies, hiking and biking trails radiate from West Yellowstone into the countryside, up the mountains and down in the valleys and streams. Downtown West Yellowstone features several square blocks of coffee shops, casual dining spots, and lots of gift shops selling Yellowstone National Park memorabilia. Entertainment options are better here than in most other gateway towns—catch a show at the Playmill Theater, or study up for your park trip at Yellowstone IMAX, which shows a rotating series of movies about Yellowstone, wildlife, and pioneer history. History buffs should head over to Yellowstone Historic Center for exhibits on park history, stagecoach travel, trains, and famous bears. The Grizzly & Wolf Discovery Center offers an up-close look at two of Yellowstone’s most iconic species (the animals here are rescues or captive-born). 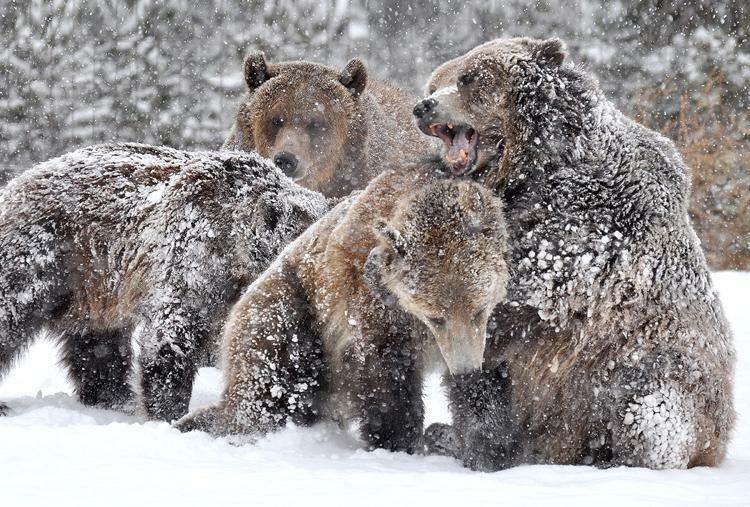 The Center is home for grizzly bears from as far away as Alaska and as close as Yellowstone National Park. Each bear and its story are unique, but they all have something in common; they came to reside here after becoming nuisance bears or orphaned cubs of a nuisance bear. These bears learn to obtain food from people, damage property in search of food or become aggressive toward people and are usually killed. Instead of being destroyed, the eight bears that reside at the GWDC were rescued and are ambassadors for their counterparts in the wild.